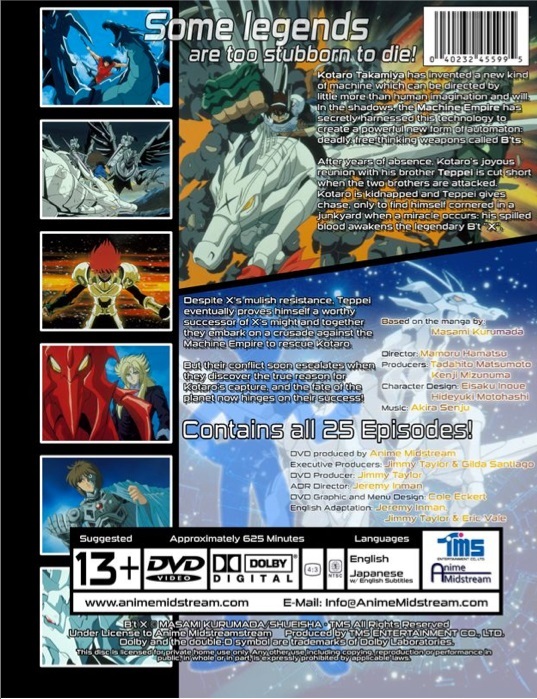 B't X contains episodes 1-25 of the anime directed by Mamoru Hamatsu. Kotaro Takamiya has invented a new kind of machine which can be directed by little more than human imagination and will. In the shadows, the Machine Empire has secretly harnessed this technology to create a powerful new form of automation. Deadly free thinking weapons called B’ts. After years of absence, Kotaro’s joyous reunion with his brother Teppei is cut short when the two brothers are attacked. Kotaro is kidnapped and Teppei gives chase only to find himself cornered in a junkyard when a miracle appears. His spilled blood awakens the legendary B’t X. Despite X’s mulish resistance, Teppei eventually proves himself a worthy successor of X’s might and together they embark on a crusade against the Machine Empire to rescue Kotaro. But their conflict soon escalates when they discover the true reason for Kotaro’s capture and the fate of the planet now hinges on their success! MUST BUY, MUST WATCH, TOTALLY WORTH IT!!!!! 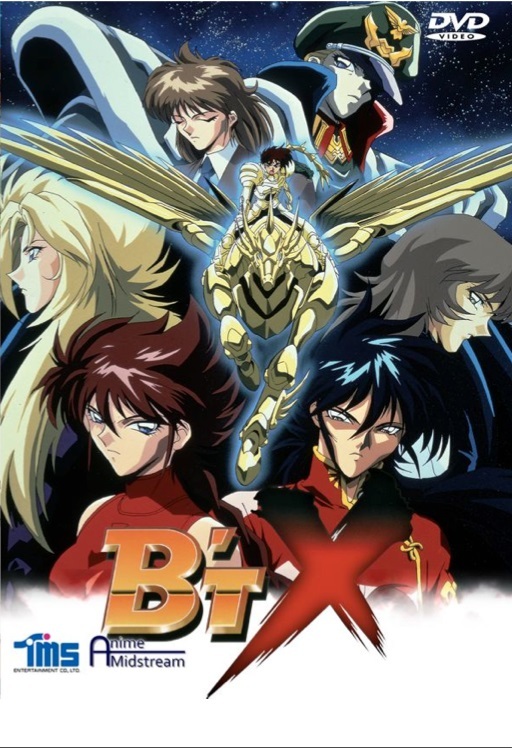 After 2 years of waiting, I finally got my hands on B'tX and I'm so happy that a company like Anime Midstream took better care of it and gave it a proper great release unlike the last company that was handling it. Now I hope Anime Midstream will get the OVA series of it.